Understanding how transmission of zoonoses takes place within reservoir populations, such as Sin Nombre virus (SNV) among deer mice (Peromyscus maniculatus), is important in determining the risk of exposure to other hosts, including humans. In this study, we examined the relationship between deer mouse populations and the prevalence of antibodies to SNV, a system where the effect of host population abundance on transmission is debated. We examined the relationship between abundance of deer mice in late summer–early autumn and SNV antibody prevalence the following spring–early summer (termed delayed density-dependent [DDD] prevalence of infection) at both regional and local scales, using 12 live-trapping grids for 11–14 yr, across central and western Montana. When all trapping grids were combined (regional scale), there was a significant DDD relationship for individual months and when months within seasons were averaged. 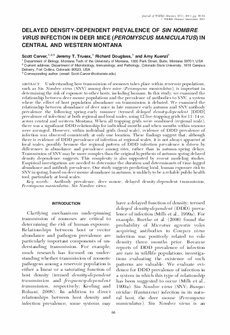 However, within individual grids (local scale), evidence of DDD prevalence of infection was observed consistently at only one location. These findings suggest that, although there is evidence of DDD prevalence of infection at regional scales, it is not always apparent at local scales, possibly because the regional pattern of DDD infection prevalence is driven by differences in abundance and prevalence among sites, rather than in autumn-spring delays. Transmission of SNV may be more complex than the original hypothesis of autumn-spring delayed density dependence suggests. This complexity is also supported by recent modeling studies. Empirical investigations are needed to determine the duration and determinants of time-lagged abundance and antibody prevalence. Our study suggests predicting local, human exposure risk to SNV in spring, based on deer mouse abundance in autumn, is unlikely to be a reliable public health tool, particularly at local scales.